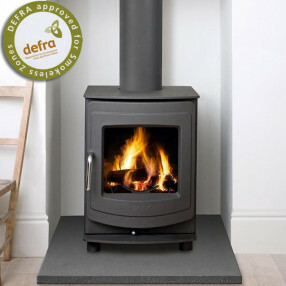 The AGA Ellesmere 5 stove is multi fuel so it can burn both logs and coal. Its design blends traditional and contemporary styling whilst keeping its AGA roots. The Ellesmere 5kW stove is clean lined and the large viewing window allow you to sit back and watch the flames. As with all AGA products the Ellesmere is built to last, the simplicity of the primary and secondary controls also make this model user friendly and easy to control the heat output.